1980 La Scalas w/ grippers , Heresy I, 1972 K-Horns w/Grippers, CT125 tweeters and 4500HZ A-type crossovers and cast frame woofers from BEC, HK430, HK 730, B&O 1700 , Akai Gx-F71,......Integra dtr-50.2.....Dynaco ST-70 rebuilt...Pioneer pl-12d with Ortofon red....2 sony CD players. With the new crazy price hikes they will have a few on hand I'm sure. I dont think Klipsch will sell near as many as they did before. I know I might have bought some new Hersey's but not now I will look for used. My first thought when I heard new prices was Heritage speakers will be gone in a few years. I guess we will see. Need help choosing a receiver! https://www.paducahhometheater.com/ Corys place and phone. Those look to be type A crossovers ,,,no diodes the type AA has diodes to protect tweeter. I did same thing for my Ks when Bob still had those. https://www.manualslib.com/manual/1138944/Onkyo-Ht-R695.html?page=48&term=equalizer+setting s&selected=1 This all I could find in your manual for tone controls. so not sure you can change much on it. I didn't like the automatic set up on my Integra so I just set equalizer to the sound I liked on 2 channel sound and it sounded fine on 5.1 sound then. I dont know if you can adjust your equalizer setting on yours but I would try it. Oh yea loosen and retighten all those connections on the board if you have not already done that. Just buy caps from Bob.....then get the woofer inductor from here https://www.parts-express.com/erse-super-q-25mh-16-awg-500w-inductor-crossover-coil--266-908 Take those diodes out. That will change it to a Type A crossover which most think is better. You can always change it back. I dont think Bob has the oil caps anymore. Here is schematic for type A. Type AA which is what you got now. I did not like the Yammy sound on 2 channel then found1970s HK 430,630...so when it came time to try AVR I got a Integra from accessories 4 less …..it sounds awesome after I adjusted the tone manually and I can also listen to 2 channel for music it also has phono input. Pretty easy to set up for all the channels. My friend has a Yammy AVR and it seemed a bit more difficult to set it up to me. I still got my Akia GX-F 71 3 head deck and still listen and record on it. Still got cassette deck in Jensen Healey a Blaupunkt and a player in the 4 runner. I have about 40 recorded and pre recoded tapes still sound good. Maybe this is wrong....but its been there a long time. In around 1983, we have the crossovers for the Klipschorn, LaScala, and Belle Klipsch becoming separate designs. 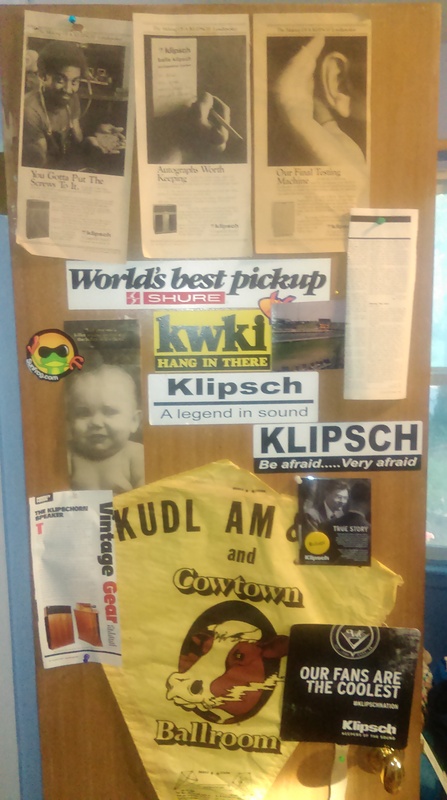 We have the AK for the Klipschorn, the AL for the LaScala and the AB for the Belle Klipsch. At that point also, the Klipschorn crossover became a two section crossover with the woofer section mounted inside the woofer door. We do not build the AK, AL, or AB crossovers since they are generally considered to be "not the best". By around 1989, the design of these crossovers had changed (evolved) to the AK-3, AL-3 and AB-2 crossovers. We do build those. Looks like the Belle had different one in 83. Looks like a Belle to me.